Have you ever walked across your classroom and forgotten what you wanted? Have you ever driven to work and not remembered the trip? Has your child or a child in your classroom ever said something you later struggled to recall? If you answered yes to any of these questions, you may benefit from more presence and focused attention in your life. WHY SHOULD EARLY CHILDHOOD TEACHERS PRACTICE MINDFULNESS? An exciting and growing area of research has highlighted contemplative practices, such as mindfulness and reflective functioning, as promising and practical ways to prevent and reduce the stress of teachers. Dr. Amy Saltzman defines mindfulness as paying attention to your life, here and now, with kindness and curiosity. Early childhood teachers who formally practice mindfulness report to have lower levels of depression and workplace stress and higher quality student-teacher relationships. The field of early childhood is full of joy, laughter and making memories with a plethora of staff and families. It is also a field where teachers are subject to multiple stressors, including low wages, challenging child behavior, low occupational prestige and inadequate role preparation (Friedman-Krauss et al., 2013; U.S. DHHS et al., 2016; Whitebrook et al., 2016). Programs close and new programs open. Families move their residence, children grow up and go to school and teachers search for new positions for reasons such as increased income, different hours or to care for their own children. With 60 percent of U.S. 3–5 year olds spending an average of 36 hours a week in center-based childcare (Mamedova et al., 2015), teachers form a central part of many young children’s lives. Cultivating Healthy Intentional Mindful Educators (CHIME) was created by Nebraska Extension to support and enhance the well-being of early childhood educators. In a 2017 pilot study led by Dr. Holly Hatton-Bowers, assistant professor and early childhood Extension specialist at University of Nebraska–Lincoln, 43 early childhood teachers from four programs in Lancaster and Seward counties participated in the initial development of the CHIME program. Results of the pilot demonstrated that practicing mindfulness and reflection led to less depletion of teachers’ cortisol, a biomarker of stress, as they progressed through the workday (Hatton-Bowers et al., 2018). Extension Educators Jaci Foged, Carrie Gottschalk and LaDonna Werth contributed to the materials developed by Dr. Holly Hatton-Bowers, and have facilitated CHIME sessions to participants. The handbooks and materials were designed by Karen Wedding of Nebraska Extension in Lancaster County and Mary Thompson of the UNL College of Education and Human Sciences’ Pixel Lab. Since the pilot, CHIME has been offered in Lincoln and Seward. An online class had participants from across Nebraska. The CHIME program consists of eight weekly sessions. Participants in CHIME receive a participant handbook and journal which are used throughout the CHIME sessions. The handbook contains everything childcare professionals need to participate in the class — including handouts, readings and homework. The guiding teacher tracks completion of the homework assignments, so some of the pages are printed on duplicate paper. The participants use the journals in each session, as well as daily, for the duration of the program. A guiding teacher manual was developed for facilitators to use throughout the program. 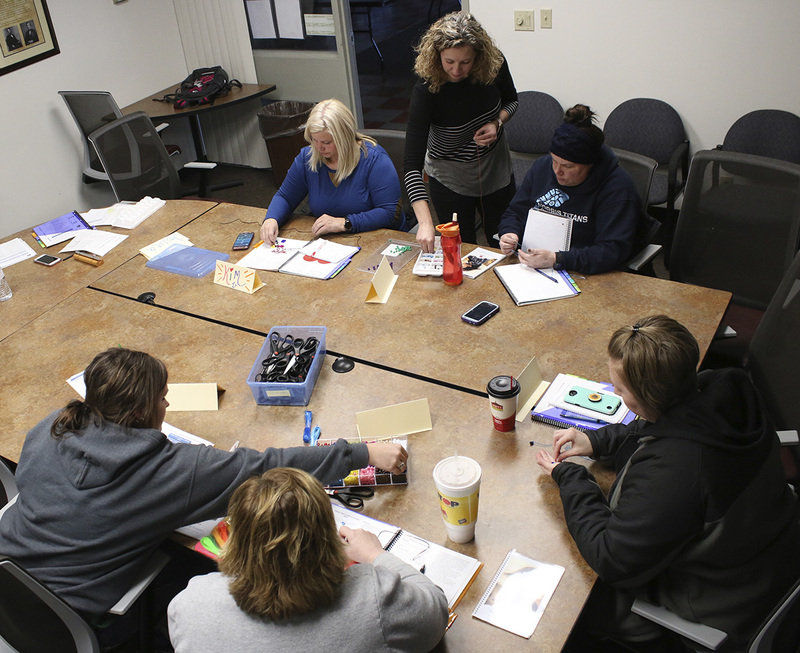 Participants who complete the full program (eight sessions) earn up to 16 Nebraska Department of Health and Human Services approved in-service hours. CHIME was recently presented to collaborators in Recife, Brazil and will be translated into Portuguese. This fall, Extension educators from across the state will participate in an intensive eight-week training named Just Be, followed by a 2-1/2-day training retreat where they will be trained to facilitate CHIME in their area of the state. Hatton-Bowers, Foged, Gottschalk and Werth will develop and teach this new training. Personal practice in mindfulness and guided reflection is necessary to be able to successfully provide instruction to others. CHIME will be delivered to early childhood educators across the state beginning in the spring of 2019. Nebraska Extension plans to conduct parallel studies for delivering CHIME as a means to learn more about various ways to promote the well-being of educators and the children for whom they care. If you or someone you know is interested in learning more about CHIME, or would like to have CHIME delivered at your program, contact Dr. Holly Hatton-Bowers at hatttonb@unl.edu or 402-472-6578. HORTICULTURE — Are you interested in gardening and enjoy helping others? Become a Master Gardener volunteer!